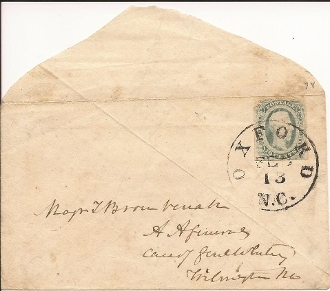 Confederate Cover, C.S. #12 postmarked Oxford, N.C. Feb. 13/ (64) addressed to Major T. Brown Venable, A. A. General, Care of Genl. Whiting, Wilmington, N.C. Ocean depth chart homemade cover. Thomas Brown Venable was commisssioned on 7/18/61 as Lieut. Colonel of the 24th North Carolina Infantry. He served as A.A. General to Generals French, Clingman, Whiting & Holmes.